Well I haven’t posted anything in about three months but here I am. I have been knitting this whole time I just didn’t post. So now here I am, knitting and hopefully a couple of times a week I’ll be sharing with you all. I’m thinking that I try to post multiple times a week about what I’m working on and what new projects I would love to try. 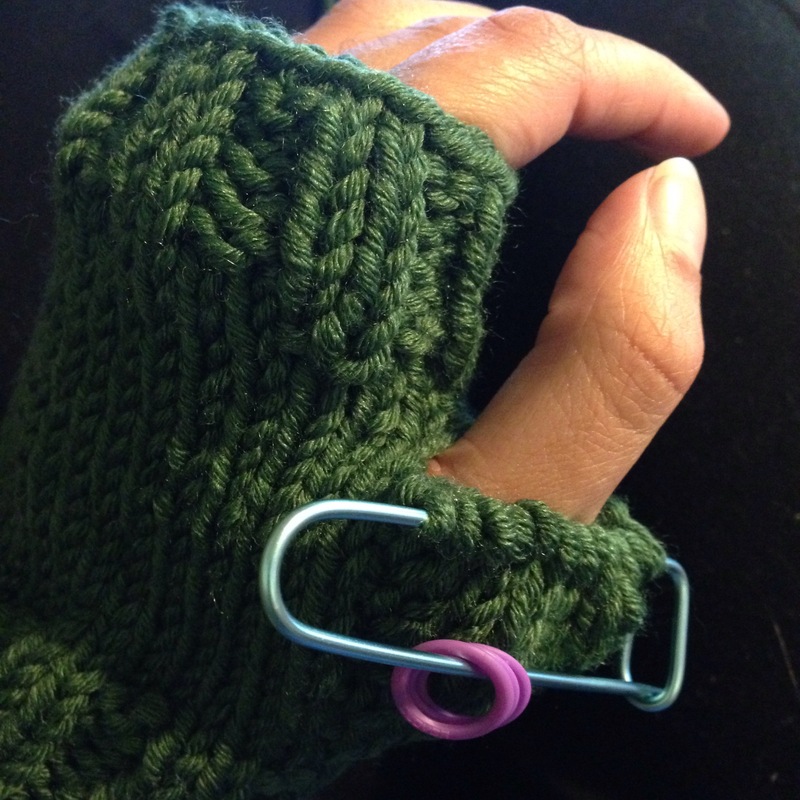 This past week I’ve been making pairs of finger less gloves in multiple colors. These are for the Craft Bazaars that I participate in. I’m starting much earlier than I did last year but now I know what to expect and know what better to prepare for. It’s mostly done but I just need to finish the thumb. I also realized that I’ve had this blog for a year so that’s exciting. Hopefully within this next year I’ll have more posts than the last. I know, I know its been weeks since the clue was released but a lot has happened since then so it took a while to get it done. My mom seamed all of the squares together and it took some time especially because she needed a good source of light to do it. First we laid them all out in the order that they were going to be stitched together. I took pictures of the whole process and how she stitched them together. 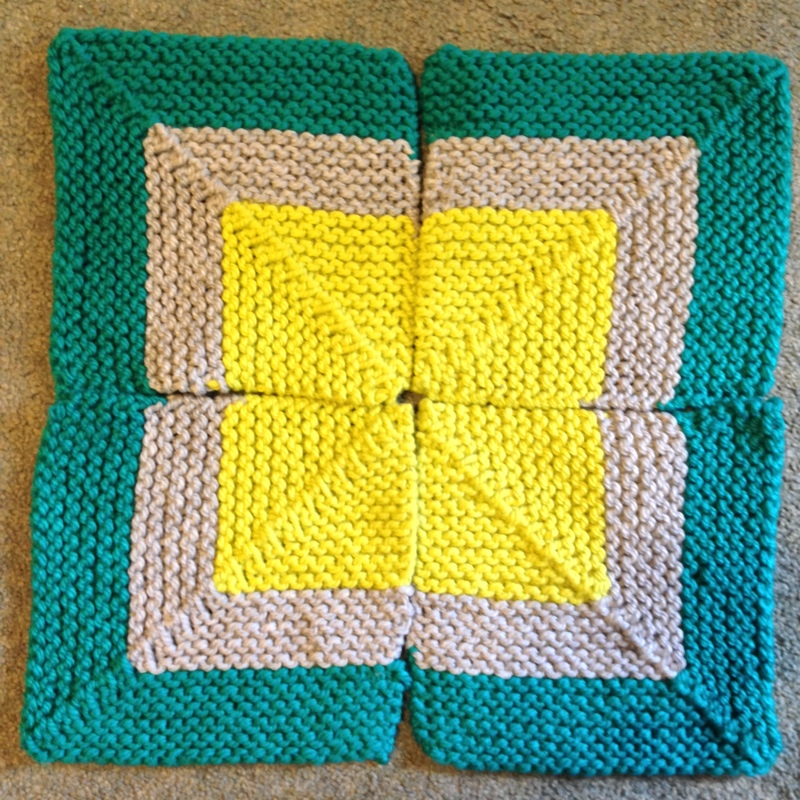 On the Yarnspirations Facebook page they said that you should start at the center square and work your way outwards but that’s not how she did it. The videos that they posted weren’t that great because what they showed weren’t even squares that we’ve been knitting and on less bulky yarn. Overall not so good but my mom stitched them together the way she usually does. She started on each edge and stitching them together. Then she added the next row. 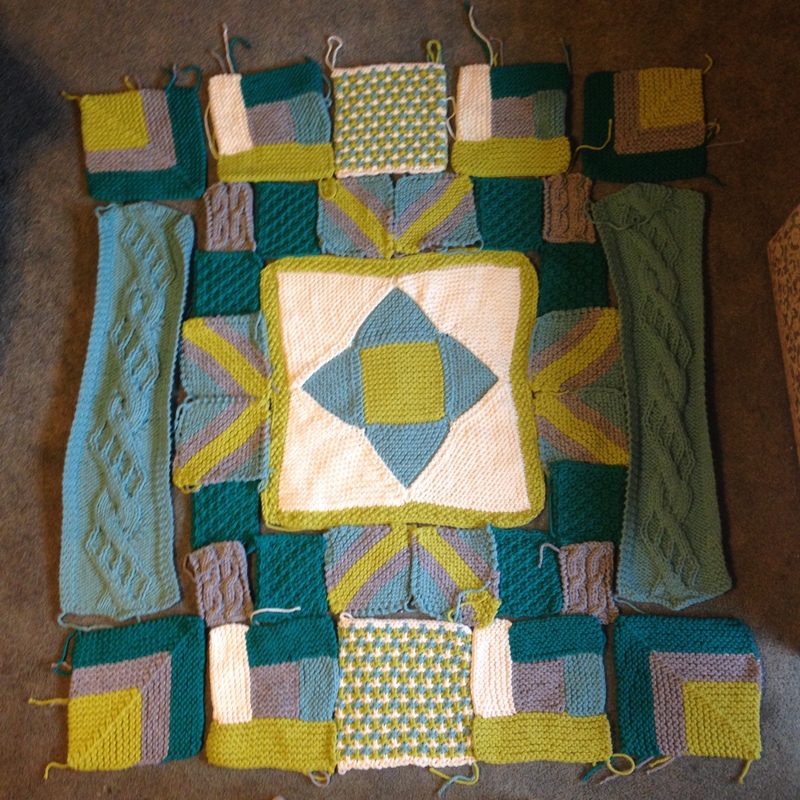 Next she added the squares around the middle square and then put them all together. Last she stitched the long panels along the edge. We did rotate some of the squares and changed them for what the instructions and the diagram said but I think it looks great. My brother’s head peeking out behind the afghan. Here it is all stitched together. Thanks to my brother for helping me out and holding it up. I’ll have Week 10 done soon and post it for my readers. Thanks for reading and let me know how your KAL/CAL went. Update: Yarnspirations has updated the Week 8 clue to fix mistakes that were written in the pattern. This week was the Whirly Square. It’s much bigger than any of the others we have knit at 22 in and luckily we only needed to make one. I apologize that it took me a week to post but my mom got this done at 11 pm last night. 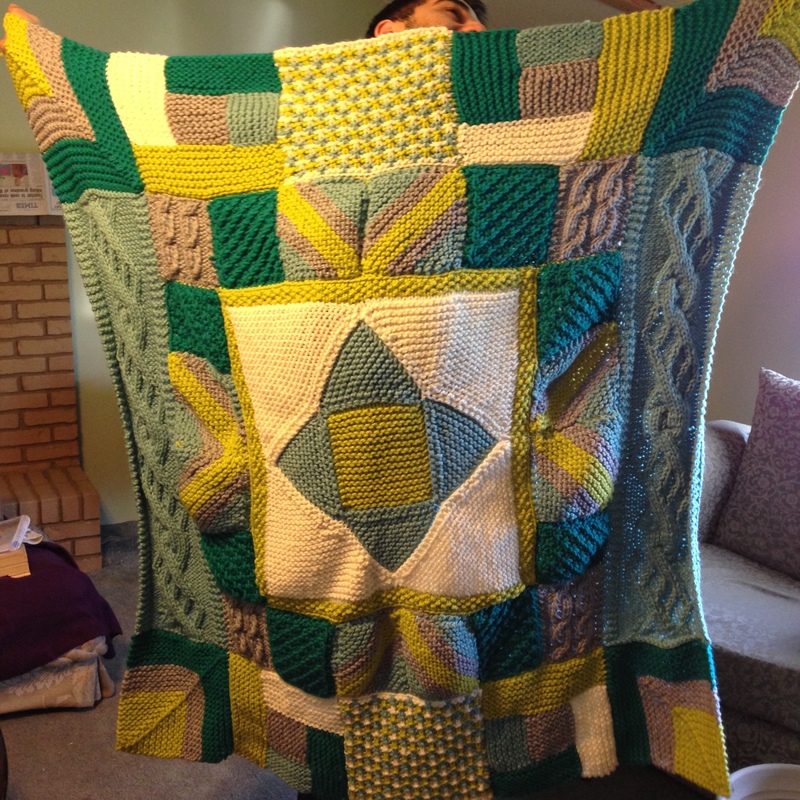 My mom knitting the square. My mom knit this one but we had some struggles reading the pattern and following through. I also found that many people were having similar issues by reading Facebook comments. It was a bit of a disappointment that it was written poorly and that the video they put up this week was not good in helping to understand what needs to be done. It was surprising as the past seven clues were written well and the videos were helpful if I didn’t understand the pattern. 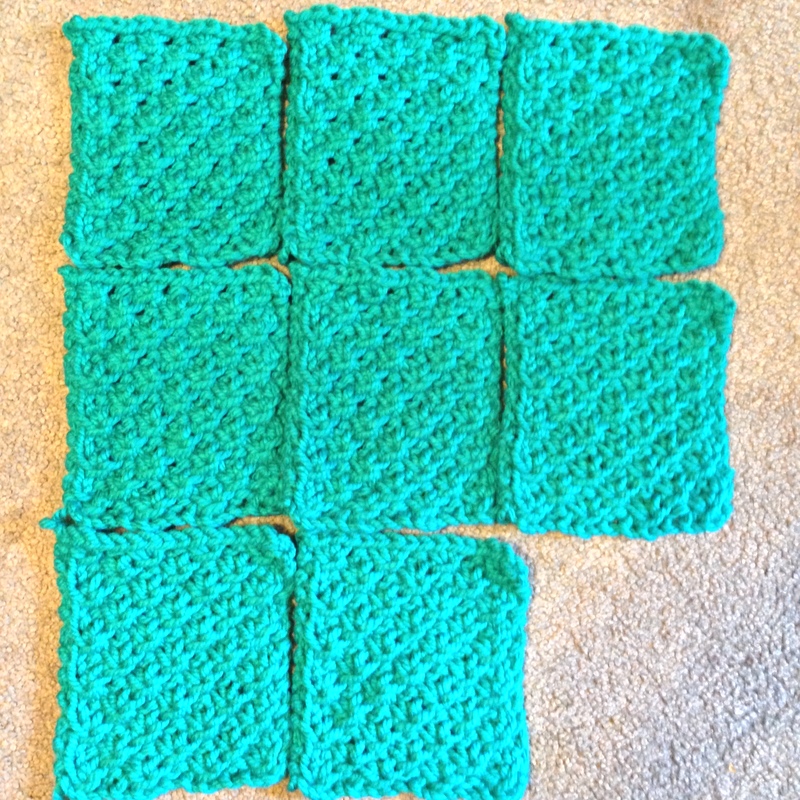 The first thing that needs to be done is the Center Square, knit 30 rows in contrast A (garter st). 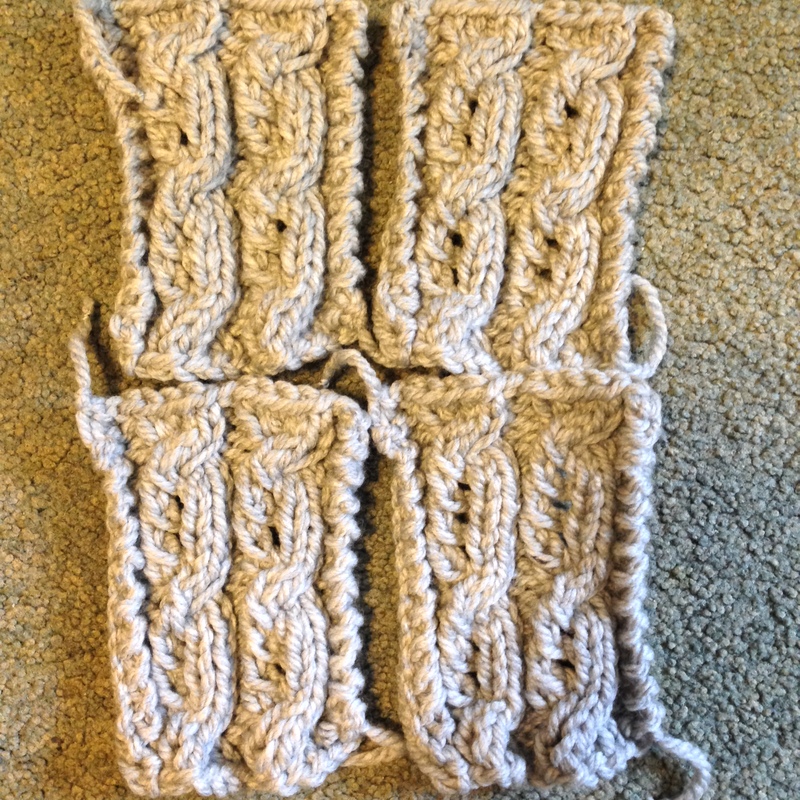 Then to change to 5 dpn’s and knit one more row in contrast A and then change to contrast B and knit 1 row. This is different than what the instructions say but bear with me. Then take the second needle and pick up and k 15 sts across the left side edge. Next with the third needle pick up and k 15 sts along the bottom edge and then with the fourth needle pick up and k 15 sts along the right side. 60 sts total, 15 sts on each needle. Then purl one round. Next you k the four triangles separately. 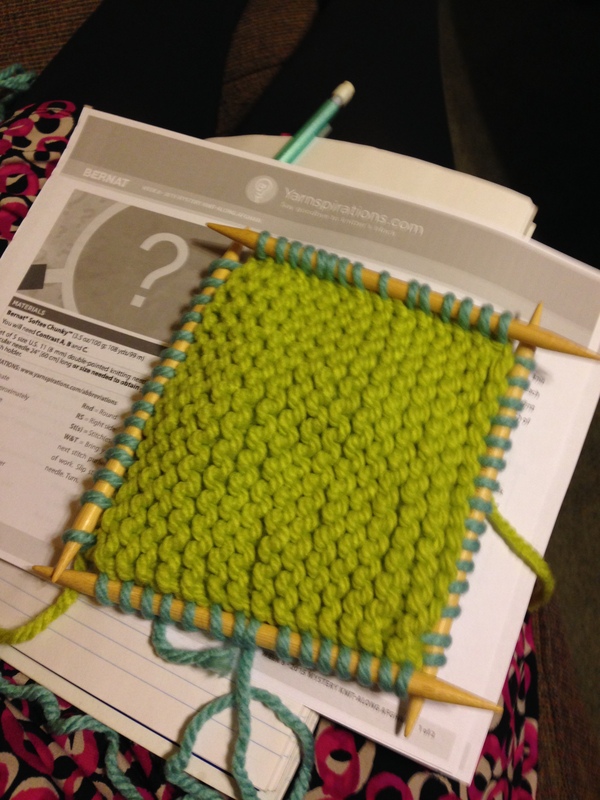 The special st in this pattern is wrap and turn (W&T) – Bring yarn to front of work. Slip next stitch purlwise. Bring yarn to back of work. 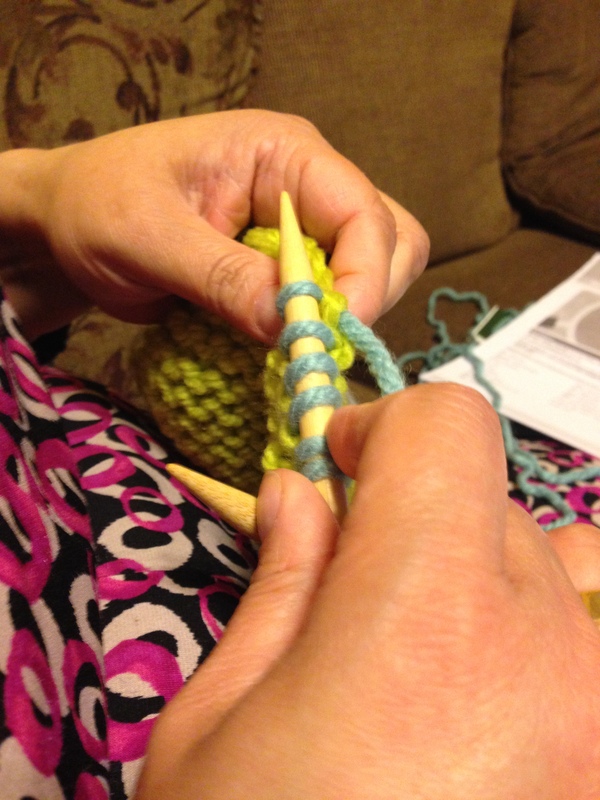 Slip stitch back onto left-hand needle. Turn work. Then take working yarn to the back. all odd rows work as established. 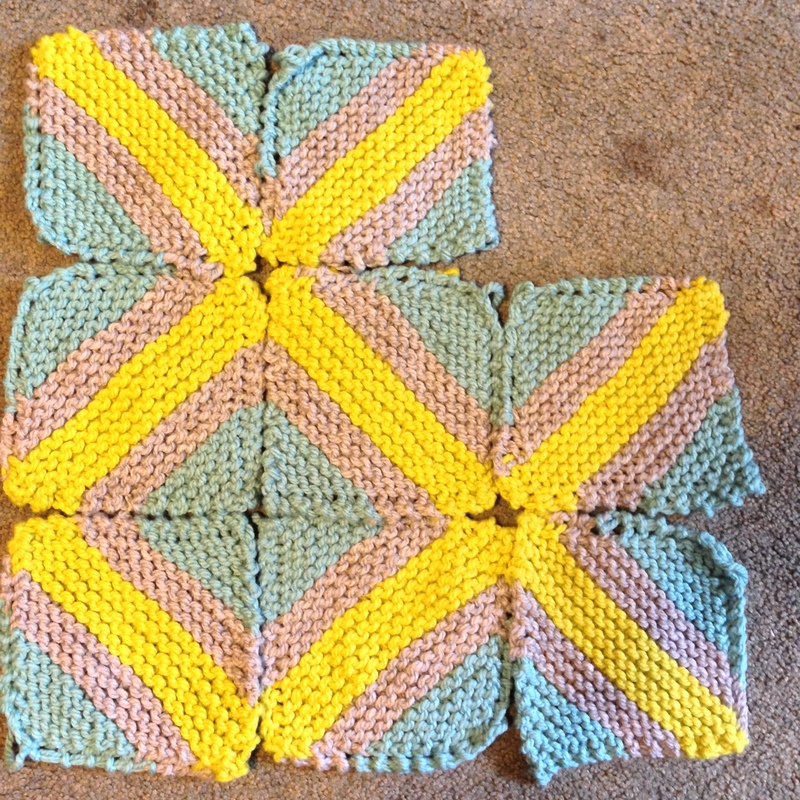 Repeat this pattern for the 3 remaining sides of the Center Square. After this you knit the second set of triangles. This part of the pattern was written well so we followed it as is, but it did take the longest time to do. Finally the border, sorry I don’t have pictures of the process. 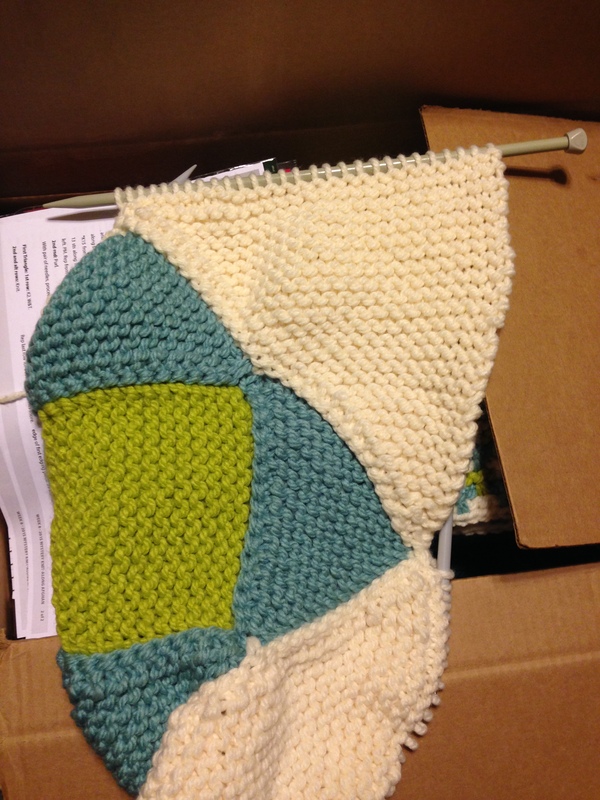 You change back to contrast A on circular needles and have all 212 sts on the needles, 53 sts between each st marker. 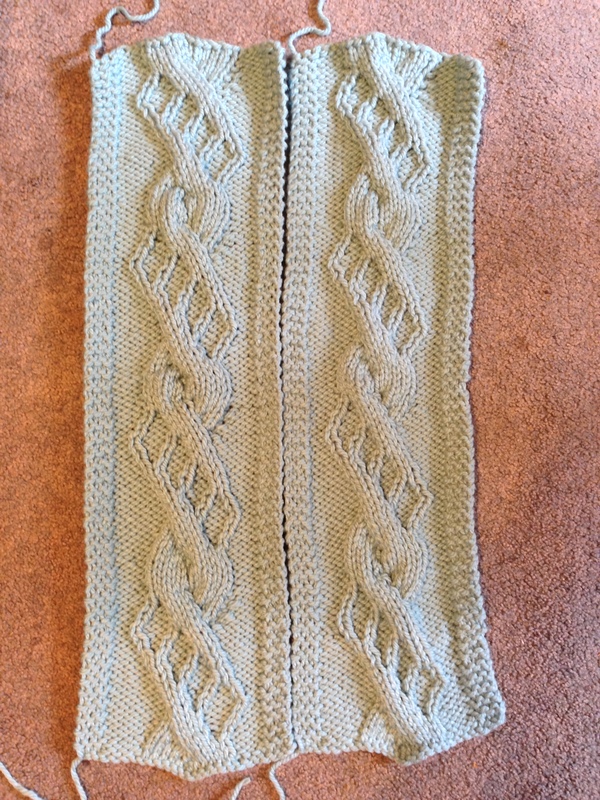 The border is done in seed st and the first part is written correctly because it is done over an odd number of sts so you knit the first st in every row. The second and third side are written wrong because it is done over an even number so you k the first st in the one row and then the next row you purl the first st. Make sure you just follow in seed st and follow the pattern. Many people also commented on this on the Yarnspirations Facebook page. 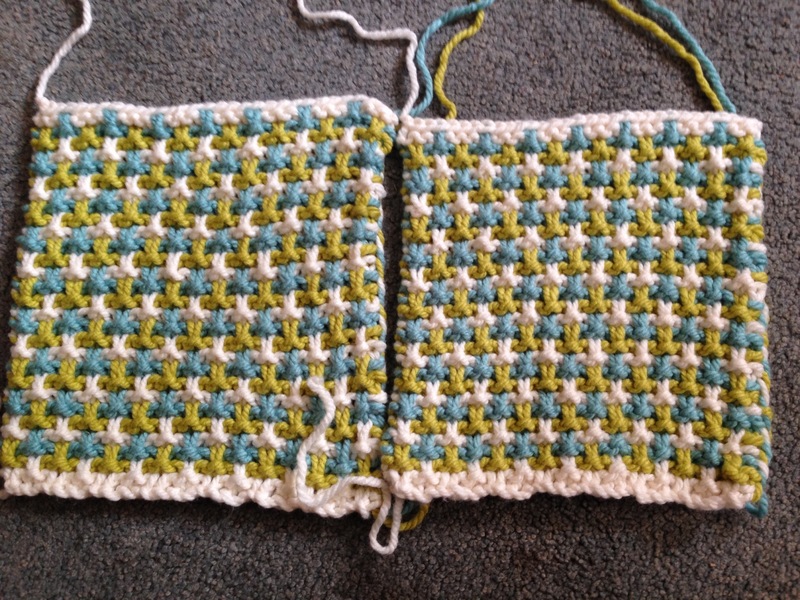 The last border is written correctly so you knit the first st of every row. This pattern was not written well and it was a little disapointing that it took us the entire week to knit one square so hopefully this week is better. Thanks everyone for reading and the comments, if you have any questions I’ll try to answer them. 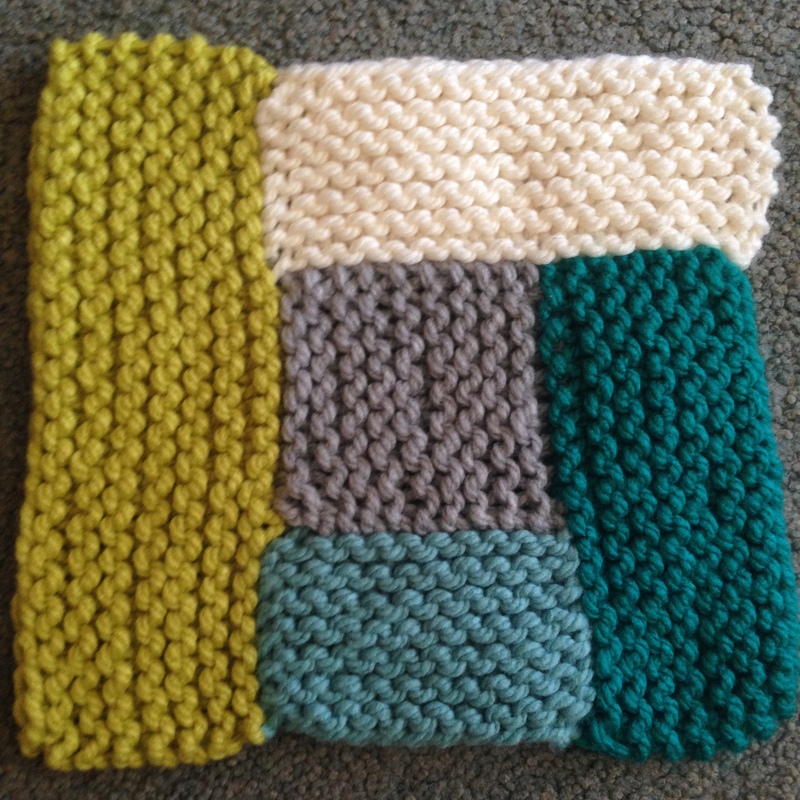 The Log Cabin square was very easy to do, it’s all knit in the garter stitch (knit every row) all I needed to do was pick up stitches along the edges. A lot easier than it sounds. While I have done this before on my own it was nice to watch a video explaination. I am a very visual learner. 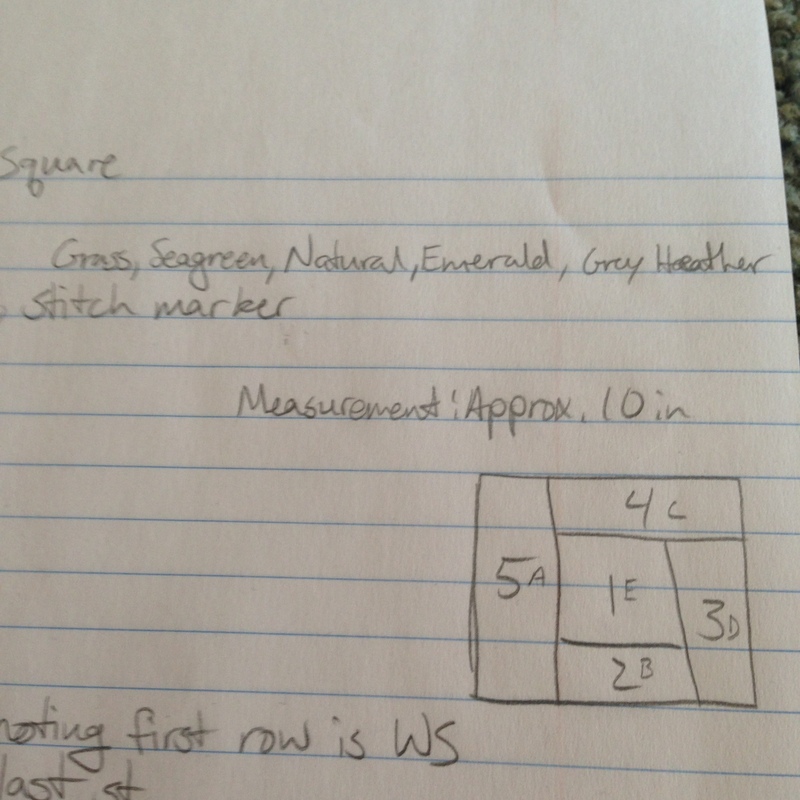 And the illustration of the square was very helpful to know which color contrast was next. The illustration explains how the squares are added, I added the contrast letter so it would be easier for me to follow. 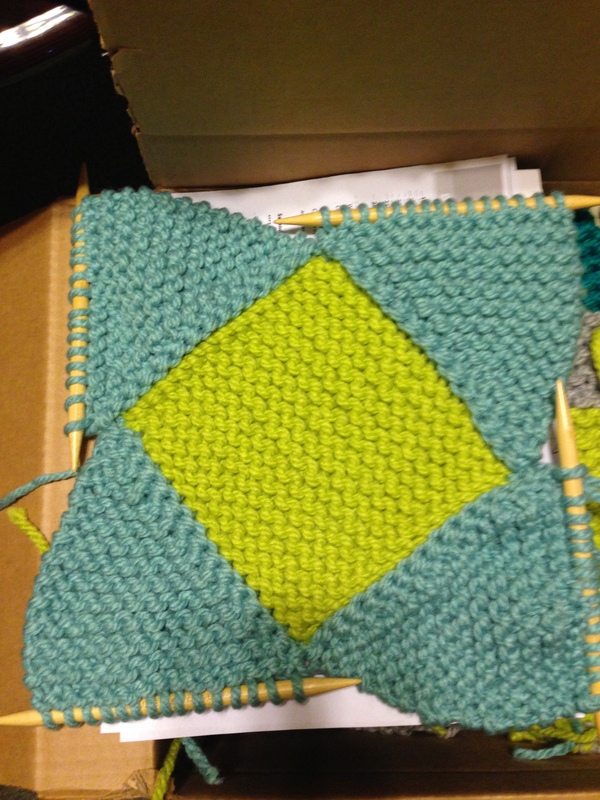 This week we were to make 4 squares and we used all 5 colors, Seagreen, Emerald, Natural, Grey Heather, and Grass. 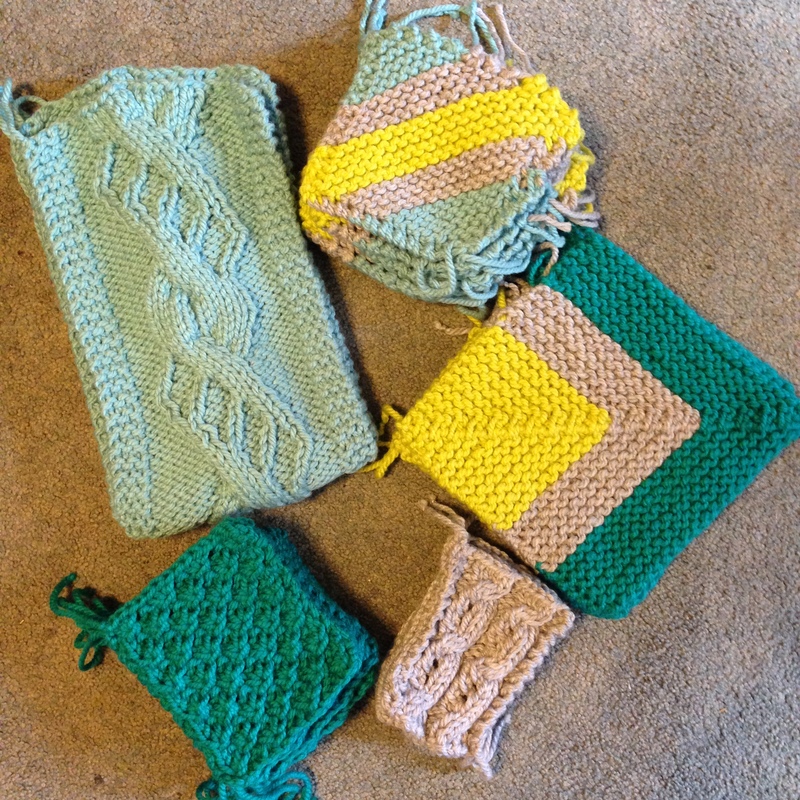 I’ve been taking my time knitting the squares but I can’t wait until tomorrow for week 8. If you’re doing this KAL/CAL let me know how you’re doing. I know that it took me an entire week to post about week 6 but last week was busy so I’m sorry. This week was the Tweed Stitch and we finally used color C. I enjoyed making it but changing colors every two rows was a lot, a least the yarn was carried up the side. This week we were to make 2 so again my mom and I each made one. Mine is on the left hers is on the right. You can see that are gauge is different so they are a little different in size. We’ll make it work. When I’m done typing this I’ll get working on week 7 and have a new post for you all soon. Let me know how you’re doing on this KAL/CAL. Now we’re halfway through the Yarnspirations Mystery Afghan KAL/CAL and I’m enjoying it. Every Tuesday I can’t wait to start on the clue and see what new pattern or stitch I can learn. Week 1 was the Mitered Square. So far it has been the easiest one. The colors used were Emerald, Grey Heather, and Grass. The first week the instructions said to make 4 and I got them done on the first day. 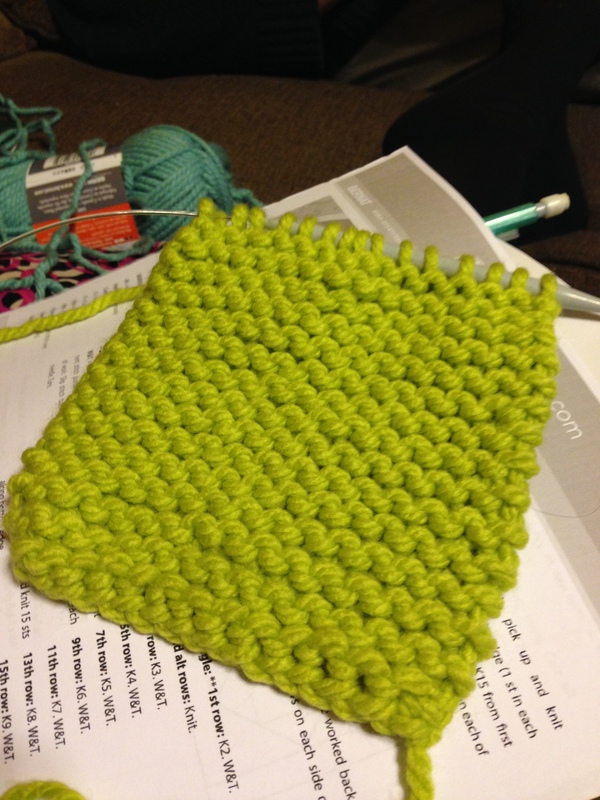 Week 2 was the Eyelet Cable Square. Now I don’t like cables so my mom made them. She got them done pretty quickly, this week needed 4 squares also. The color used was Grey Heather. Week 3 was to make 8 of the Corner to Corner Square. This was a little more difficult because of the striping. There are a lot of ends that need to be weaved in that I haven’t done yet. The colors used were Seagreen, Grey Heather, and Grass. 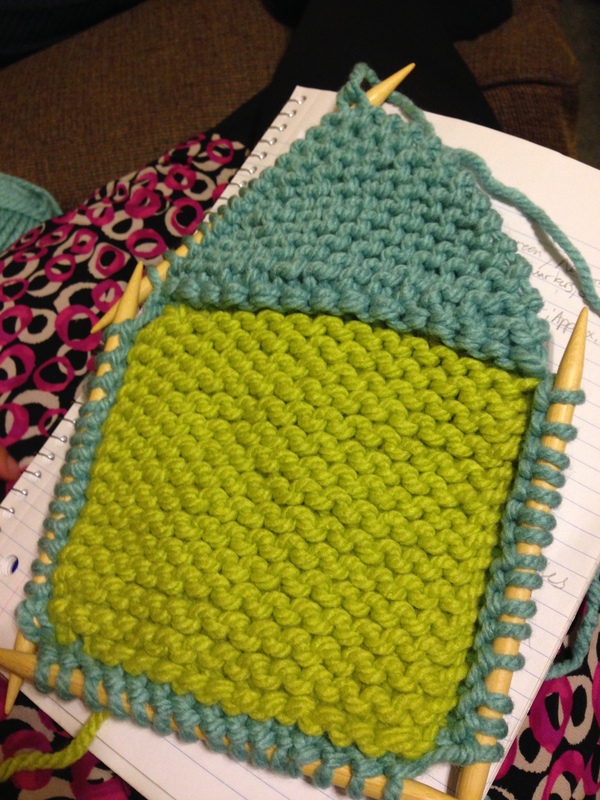 Week 4 was the Daisy Stitch. This has been by far my favorite. 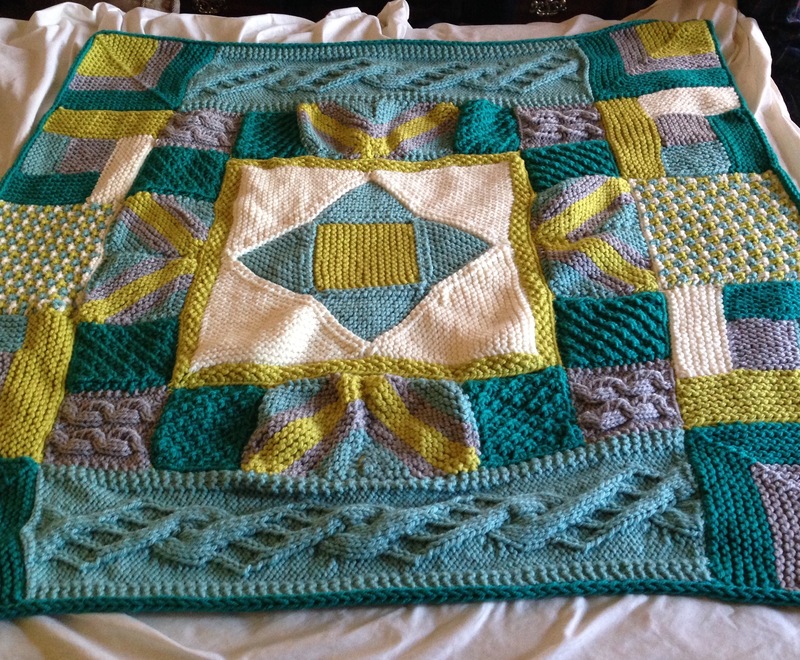 I like the way the pattern looks especially in the color Emerald. This week also needed 8 squares. The video was necessary to understand how to do this stitch. Week 5 was the Cam Cable. Not a square but a rectangle and we only needed to make 2. So my mom and I each knit one at the same time. It took three days for us to finish. The cable was difficult for me but I’m glad that I did it and I feel so accomplished. The color used for this one was Seagreen. I am glad it was a lighter color because it was easier to see the cable. I’m excited to see what the next five weeks bring and how the afghan comes together. If you’re doing this Mystery Afghan KAL/CAL let me know how you’re doing in the comments.